They won’t harm you – but they will move into your home, make a mess and leave a foul smell behind – Who wants a guest like that? With fall in full swing we have seen a drastic increase in box elder bug sightings here in Regina. Also known as the maple bug, box elders become an annoyance in the fall when the cooler weather sets in. They are an agricultural pest – they feed all summer in crops and fruit trees, then they look to bunk down in your home for the winter. We’re going to let you know how to detect them and explain why they aren’t a health hazard, just a dirty, smelly, annoyance. Maple bugs are black with red or orange markings and are approximately 12.7 mm in length as a full grown adult. When nymphs first hatch they are bright red and stick close together for warmth. These pests release a compound that deters their predators allowing them to grow rapidly without being preyed on. Maple bugs only nest indoors during the fall and winter. During spring and summer, they dwell in box elder, maple and ash trees, giving preference to female box elders. Maple bugs are quite harmless and do very minimal damage to any trees they encounter. They are commonly found grouped together along warm outside walls of houses and buildings, along foundations, under loose siding, under windows and in walls/door cracks. Commonly, we see an influx of maple bugs in the spring as they emerge from their warm winter hideaways. Maple bugs, while a nuisance, are harmless to property, structures, pets and house plants. 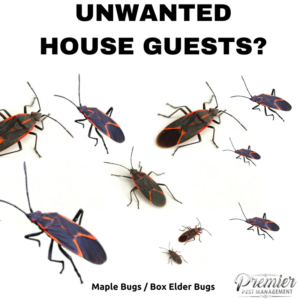 The biggest concern with maple bugs is that their excrement can stain curtains, furniture and clothing. Aside from that, they emit a foul odor when squished. After emerging in the spring, maple bugs fly to the nearest boxelder tree to deposit their eggs. Boxelder eggs are oval shaped and rust coloured. During their stay, they feed on the soft parts of the box elder trees including leaves, flowers and new twigs. They are able to extract juices from the trees they live for sustenance as well. Maple Bugs only become a problem when they infest the inside of homes, storage sheds or garages. 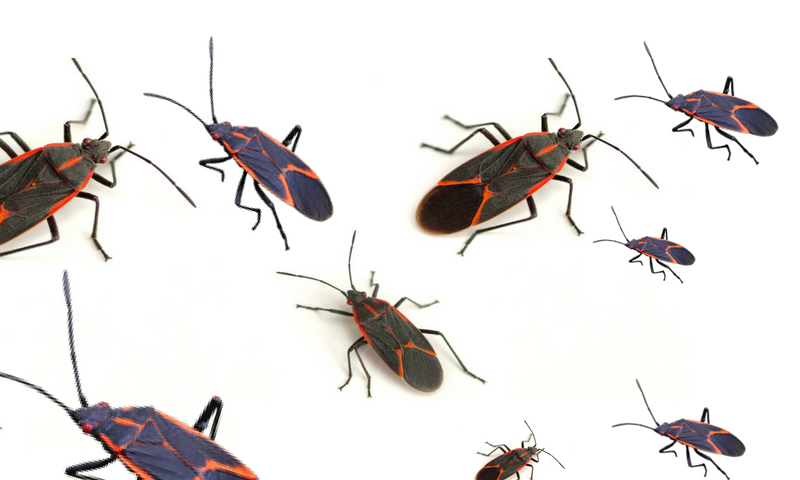 It’s important to note that certain structures are more likely to become attractive to box elder bugs. Homes with a lot of sun exposure, that are at higher elevation than others or those on flat ground with no surrounding buildings are ideal ground for maple bugs. If maple bugs have turned from nuisance to pest, we can help! We service Regina and the surrounding area.